Stay at this luxury country estate where excellent service, a restful atmosphere and delicious wines are the order of the day. Life at this Cape Winelands accommodation enjoys a pace and rhythm all of its own and guests are usually left to their own devices. 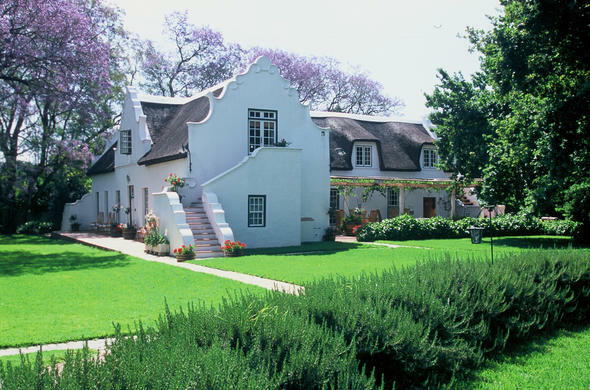 This lovingly restored four star Cape Winelands manor, built in the classic Cape-Dutch style in 1692, was first owned by Frenchman, Jean du Buis, one of the hundreds of Huguenots to arrive at the Cape as religious refugees in 1688. Today, the smallest of pampering touches, thoughtful service, and the breathtakingly beautiful environment at this Cape Winelands accommodation has resulted in a restful retreat that is nothing short of delightful. Afternoons are for long lazy walks, snoozing by the pool or a therapeutic rooftop massage beneath a bedouin tent. In cold weather, you can retreat to a comfy leather sofa in the thatched attic lounge at this Cape Winelands accommodation, where a selection of fine Estate wines, a roaring fire and interesting reading material provide just the right kind of atmosphere for a winter break. Evenings at this welcoming Paarl accommodation typically include watching the mountains turn pink as the sun sets - a glass of Chardonnay in hand - before joining the other guests in the candlelit 18th century dining room at tables set with fine china and silver. Alternatively, you could dine al fresco, with only the stars above in the African sky to accompany the delicious meal. Dining is a sensory experience. Every meal is a production. The smell of roasting coffee and oven-baked bread will coax you out of bed in the morning to a spread of freshly picked fruit, yoghurts, delicious home-made jams and tables strewn with roses, hydrangeas and lavender. The resident chef produces daily menus, often Cape Malay influenced, using fresh local ingredients from Palmiet Estate's own herb garden and locally sourced game and fish. Guests dine together, and meals are accompanied by a selection of regional wines, and of course the excellent Chardonnay, Sauvignon, Chenin, Shiraz and Merlot wines produced by the Estate. Although tastes may differ, the chef will cater for private dining or individual needs. This accommodation is wonderful venue for a Cape Winelands country wedding, and if you are already married it makes for a romantic Honeymoon retreat where you can both renew your vows. Read more about weddings at Palmiet Valley Country Estate.